Dhanistha Mittal, AILET Topper 2017 credits consistent preparation! Mumbai girl Dhanishta Mittal was on cloud nine after knowing the results of AILET 2017. By becoming the only candidate to achieve triple figures, scoring 100 marks out of 150, Dhanishta secured the first position in the All India Law Entrance Test conducted by National Law University (NLU) Delhi. Daughter of Chartered Accountant parents, Dhanishta always wanted to tread a different path and decided to pursue Law. 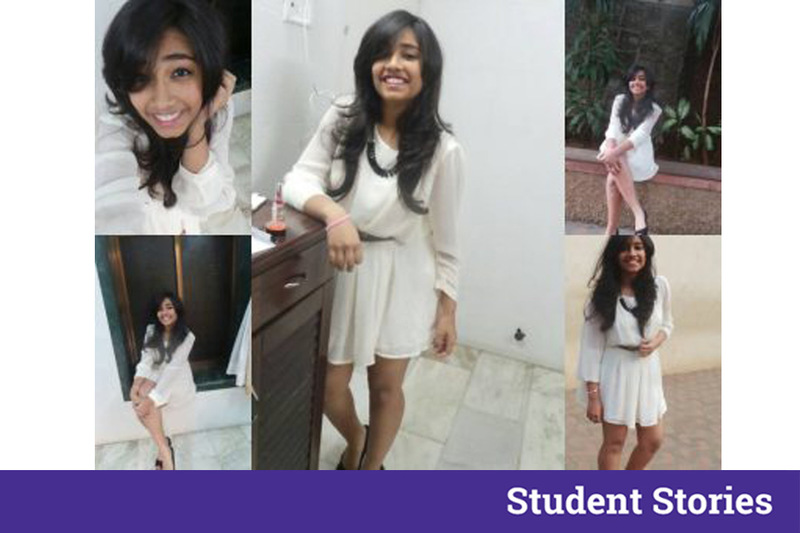 A student of Narsee Monjee College of Commerce and Economics, Dhanishta credits her success in AILET to her mentor and to following a consistent preparation and time management strategy on the exam day. 1.What motivated you to pursue Law? I was never interested in pursuing a career in Science or Arts fields. I had researched on alternate courses and took the help of my teachers as well. One of my teachers suggested taking up Law as a career and I found it to be the perfect option for me. 2.When did you start preparing and what was your section wise strategy? GK – I prepared for this section on a daily basis. Since I am not fond of reading newspapers, I used to study from four to five Apps on current affairs. For Static GK, I consulted study materials provided by coaching institutes and browsed online resources. English – This section was never a problem for me. I used to prepare for half an hour for Vocabulary, learning 20 words a day practiced Comprehension two to three times a week and kept three to four days for idioms. Maths – I have always been good in Mathematics hence again, this section did not pose any difficulty for me. Conceptual clarity is important for this section. I started with Arithmetic first and later moved towards other topics like Mensuration, Trigonometry, and other higher math topics few months prior to the test. Logical Reasoning – I am good in Analytics and had 90 percent accuracy in Logic. I found Verbal Logic difficult. For this section, I referred online materials. I also practiced from GMAT Verbal Logic and LSAT study materials. ALSO READ : CLAT 2017 Topper, AIR 3, Radhika Sarda Shares How To Score High In CLAT Exam! 3.How was your exam day experience? What strategy did you follow that led you to success? In one word, the exam day was scary. It was an extremely lengthy paper with very tough questions. The question paper literally shocked me. I could actually hear fellow test takers crying. I decided to keep calm and solved GK first followed by Maths. Since it was my strongest section, I completed it within 15 minutes with 100 percent accuracy. Legal GK and Analysis sections were lengthy and tough. In GK, two questions were clubbed into one, e.g. Who was the FIFA mascot and what was he wearing? Reading Comprehension was replaced with Cloze test. The Logical Reasoning section was at par with CAT which made it really tough. 4.How did you balance Board exam preparations with AILET and other law entrance tests? Balancing Board exams with law entrances was not tough for me. I did not devote much time for Boards but that does not mean I ignored them. Since I was in Commerce stream with the strong aptitude for Maths, regular practice and revision helped me sail through. 5.How important were coaching and mock tests for you? Rather than coaching, I think mentorship is more important for preparation. While coaching institutes can provide you with the study materials and overall guidance, a mentor knows where exactly you need to focus on. They know your strengths and weaknesses and can properly guide you to success. Mock tests are indeed important. I took mock tests regularly which helped me improve my time management skills. I started taking mocks three months prior to the test and took around 50 to 60 full-length tests. The advantage of taking mock tests is that you encounter varied types of questions which prepare you for the exam. 6.Tell us something about your hobbies. Did you get time to pursue them during the preparation phase? I am an avid volleyball player. I was the captain of my school volleyball team. I played the sport regularly, but as the exams approached, I had to give it a break as I could not afford to spend much time on sports. However, to rejuvenate myself I used to go for walks with my pet dog. Seeing her play really helped lift my spirits. 7.What is your suggestion for AILET aspirants who will appear for the test next year? Be consistent with your studies. From my experience, I can say that cracking AILET can be nerve-wracking unless you maintain your composure. It is normal to feel stressed during the preparation stage as well given the tough sections. To deal with the pressure, take regular breaks and keep moving forward with confidence. We wish Dhanistha all the best for her future endeavors!